It was mild winter, snow was melting in Austria, lack of snow condition this winter too. On Friday one day before the race in Obertiiliach snow condition of zigzag course was ice, it was not easy and safety to decent. But we are very lucky that snow falling began Friday afternoon, snow condition was drastic change to wonderful one. On Saturday, air temp was minus 6 degree at the start, no wind sunshine!! 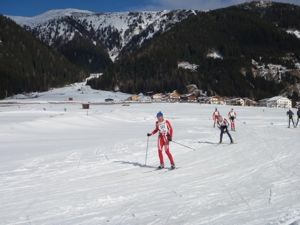 Recently there are many Nordic country skiers for this classic race. This time we could stay inside the building of biathlon center that was under construction but it was warm and enough room for changing clothes, eating foods and getting WL stamps, comfortable big room, no tents out side. Classic race was well organized with no problem. Winner is Ahrlin Jerry (SWE) 1:55:39. 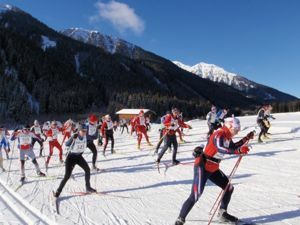 On Sunday main race was held in Obertilliach because of lack of snow in Lienz, distance was 42km shorten and course profile was same on Saturday classic race. Snow & weather condition was excellent. Wonderful day it was! Before the race I talked with one Canadian skier about his schedule this year, he told that my winter race is all in Europe from J50 to Birkebinerrennet. I found him at the bottom of the zigzag course, he was down and course out. Later I knew he was crushed with another skier and had a bad damage with his foot, then he had to cancel next eight weeks all WL ski races!! Two days zigzag course is boring for me, but it was better than cancel!